No Child Left Behind | Red Said What? The table of contents of the Common Core Learning Standards has the words “College and Career Readiness” written so often that it’s no wonder the public tone surrounding this latest round of educational reform is one of anxiety, concern, and contempt. From the father of a five-year old who supports the Common Core’s goal to make students competitive in a global environment and believes educators only started questioning tests when they became tied to job performance to the well meaning mommies who vent through social media about their child’s school experience as well as the image conscious, high performing school district superintendent who misrepresents that his administration only had four months to prepare for these changes, communities are wrapped up in the notion that the Common Core is the primary determinant of a child’s success. Now, in theory, I agree with the idea of a common educational standard. As a former commercial banker turned fourth grade teacher turned nursery school teacher and mother of elementary as well as preschool aged children, I welcome the idea of an educator generated, developmentally appropriate uniform set of learning standards that applies to all students regardless of the state in which they live. So at the very least, if a child moved, he could enter a new classroom on par with his classmates. Unfortunately, we’re not quite there. After reading the documents and listening to teachers who are active in the classroom, it’s clear that, like in the past, the majority of requirements are still developmentally inappropriate. Plus I’m hard pressed to believe that they are truly teacher generated. Furthermore, the related tests are unnecessarily hard, even when compared with the tests created in conjunction with No Child Left Behind, which were rigorous in our state and also, by the way, questioned by teachers at the time. But it will be ok. I promise. Veteran educators will tell you that there have always been evolving standards, requirements, pedagogy, and new ways to assess teacher performance. In the twelve years that I’ve been in education, all or part of our state’s standards and the related tests has already changed three times. Strong teachers with thoughtful and consistent administrations who put children first will carefully plan and adapt their curriculum as necessary to accommodate change and continue to work tirelessly to give students what they need regardless of how these changes may affect their jobs. Furthermore, professionals dedicated to educating children will communicate to them that The Fancy People tests, as my former students and I affectionately called them, are a snapshot in time; a moment that does not define who they are, determine whether or not they go to college, or have any bearing on their level of success as adults. Most importantly, these people will continue to encourage children instead to get wrapped up in simple school global readiness tasks like building a leaf pile. Let me explain. Earlier this month, Bubbe our socially sensitive, creatively thoughtful, and independent minded child enthusiastically chatted me up on the walk home from school about such an endeavor. What started as a solo project soon turned into an effort of about thirteen kids strong. First, a girl, he didn’t know impressively initiated a conversation and asked to play. As their leaf pile grew, it caught the attention of another classmate who is known to be an interrupter of sorts with a thin verbal filter. Then a third friend joined; a sweet, atypically developing child who had confidently constructed with Bubbe in the past. The kids were having fun when a conflict ensued. 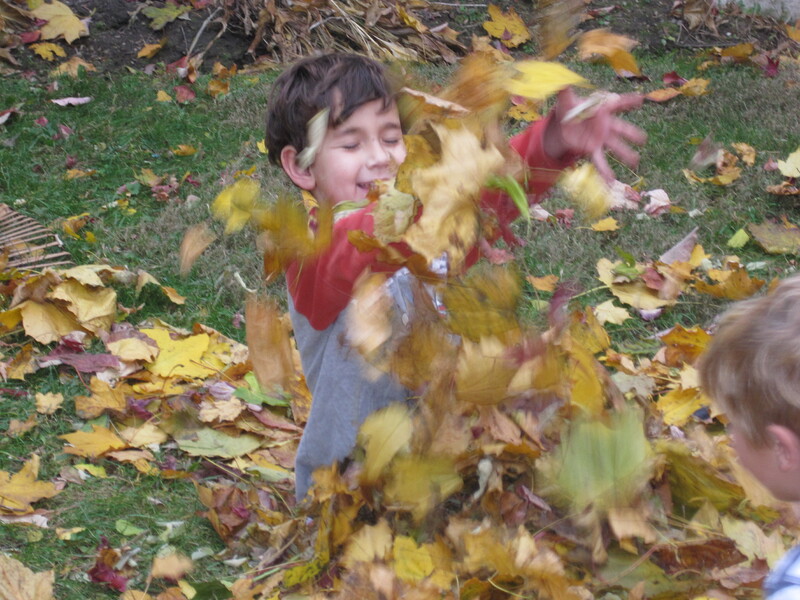 “What a stupid pile!” a boy yelled, jumping into the leaves without asking. When the pile jumping got old, the Interrupter came up with an idea. “Let’s make a leaf water slide!” he said. Together, the group transferred the leaves to the playground slide. They first tested the leaves alone; then the kids took turns sliding with them and into a pile at the bottom. Recognizing the fun, a bunch of football and soccer players stopped their game and joined in. As far as I’m concerned, that experience prepared those children for college and careers in a global, competitive environment better than all the Fancy People standards and tests combined. Twenty minutes of leaf play taught them to lead, initiate, share, imagine, invent, create, communicate, collaborate, take risks, play a part, make mistakes, forgive, be forgiven, and get along with different kinds of people. Think about it. Aren’t these the most useful and lasting determinants for success? Aren’t these the skills we adults look for when hiring someone? And aren’t these the traits we want in a classmate and coworker? So to the school official who feels pressured, the father who is hell bent on preparing his five-year old for our competitive world, and the worried mommies, please remember that stress breeds stress. Tests and standards will become a distant memory. Playing in the leaves with friends at recess will not. But The Fancy People are at it again. So what do you do? First, read the Common Core Standards, at least for your child’s grade level, understand who crafted them, and learn more about the current College Board President’s role. Two, advocate: positively, proactively, and collectively. Sit down with your principal, superintendent, curriculum coordinator, and Board of Education representatives. Find out their long term education plan, ask about curriculum adaptations, adoptions and timing, understand their philosophy about teaching children, and while you’re at it, inquire about how the current reform relates to funding sources and state mandates. And finally, do the most essential thing we can do to prepare our children for the real world; get wrapped up with them…in the leaves.